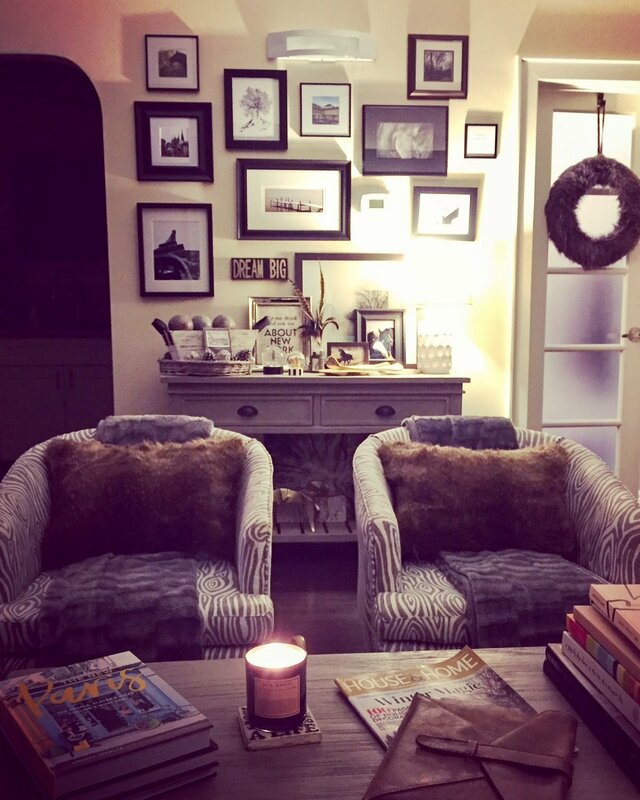 My last blog post took you through the first steps of my living/dining area refresh. From painting the walls in Ink Black from Home Depot, to my gorgeous antique sideboard from Simply Cottage in Bracebridge, the room was taking shape quickly! A part of the refresh also meant a new couch was in order too. I had originally had my heart set on a camel leather option but after much searching and researching, I came to a sad conclusion. Living in a small cottage has its limits and whoever designed the entryway of my home obviously did not have the idea of moving furniture in mind when they built it. I am limited to the size of furniture I can bring in both my front and side door (sadly) and I could not find a couch of the leather colour and type I wanted that was small enough and I was not about to spend thousands on a custom leather piece either. Soooo......I found a very, very happy replacement with the help of the amazing gals at Urban Barn in Cambridge. We had paint samples, fabrics and accessories strewn around the back corner of the store as we decided on fabric for a custom piece for my home. 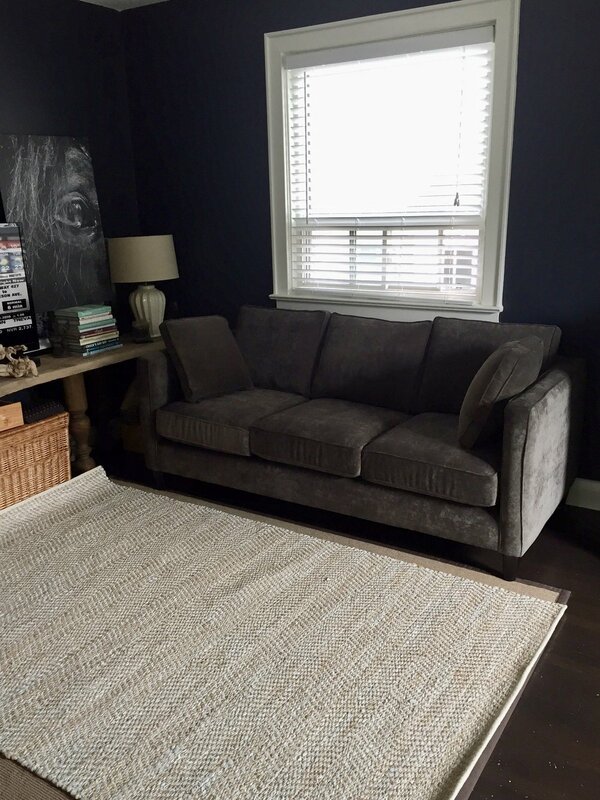 I was also in the market for a new rug too and they happened to have THE perfect one that would still allow me to bring leather into my space, just in a different avenue. After much contemplation, re-checking measurements and trying out the 'comfie' factor, I decided on the Lure Custom Sofa in a lux, cozy fabric option. I cannot say enough about how wonderful the staff at the Cambridge store were and how the entire experience of choosing, ordering and delivery have been nothing but impeccable! 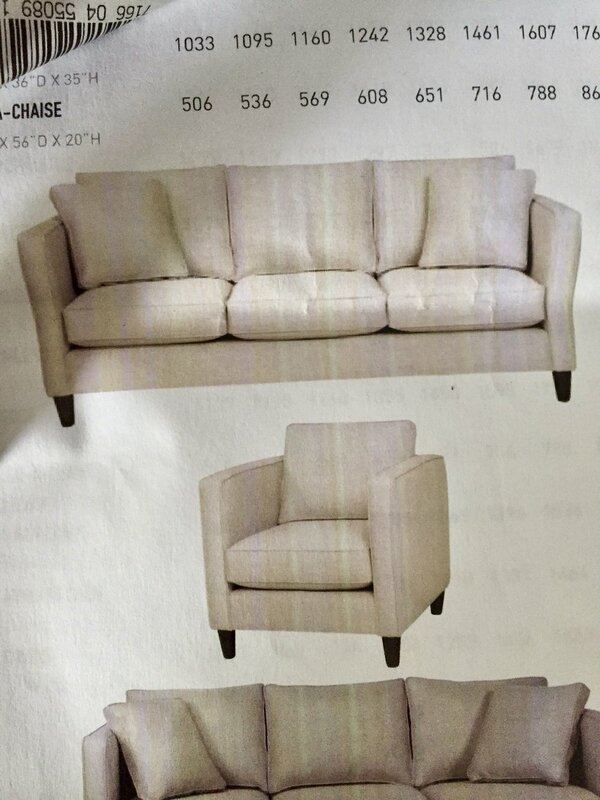 Another aspect that I am really happy about is that my couch is Canadian made (and Urban Barn is a Canadian company). It feels good to know I'm supporting our economy through my choices and receiving a high quality, beautiful end product. The day of delivery arrived (to say I was excited is an absolute understatement) and the photo above was taken literally two minutes after the pieces were placed in my living room (the delivery experience was fantastic and the guys took impeccable care of the pieces as they entered the house through tight constraints!). I mayyyy have let out a wee squeal of happiness to see the pieces in place and I spent the duration of the afternoon pulling the space together. I went with the cozy grey velvet-esque fabric to add warmth to the space and tie to the faux bois fabric in the chairs/coffee table. The leather 'rag rug' has hints of camel, grey and turquoise to tie in the sideboard and bring some light into the space. 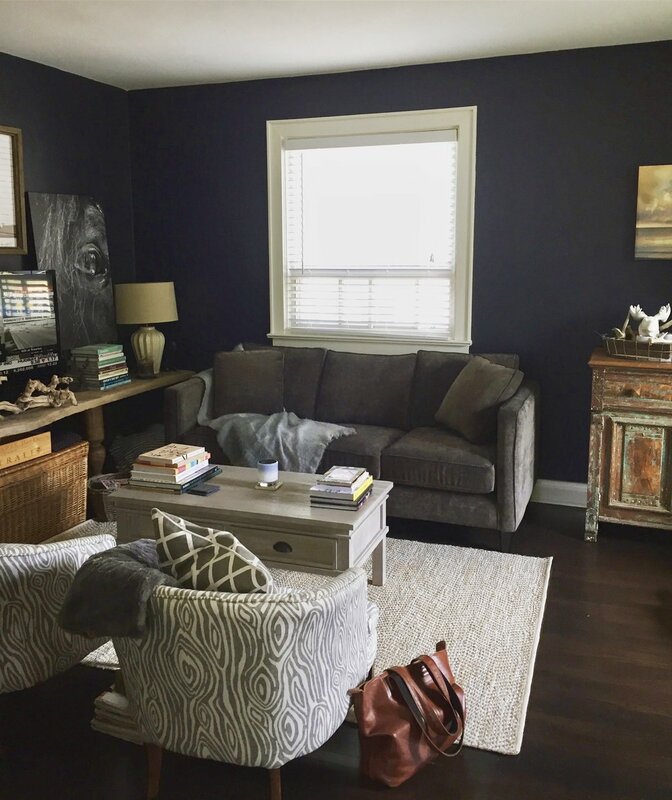 My 'forever' pieces from Willowhouse still look amazing in the space (my coffee table and sofa table on my gallery wall behind the chairs) and I just couldn't stop grinning from ear to ear as I witnessed everything coming together. With the key pieces in place, it was then time to add in just a few more accessories, but mainly, throw pillows! I had looked high and low and had an idea of what I was looking for and to say I was overjoyed when I found the perfect options at Comfort & Co in downtown Guelph would be an understatement. 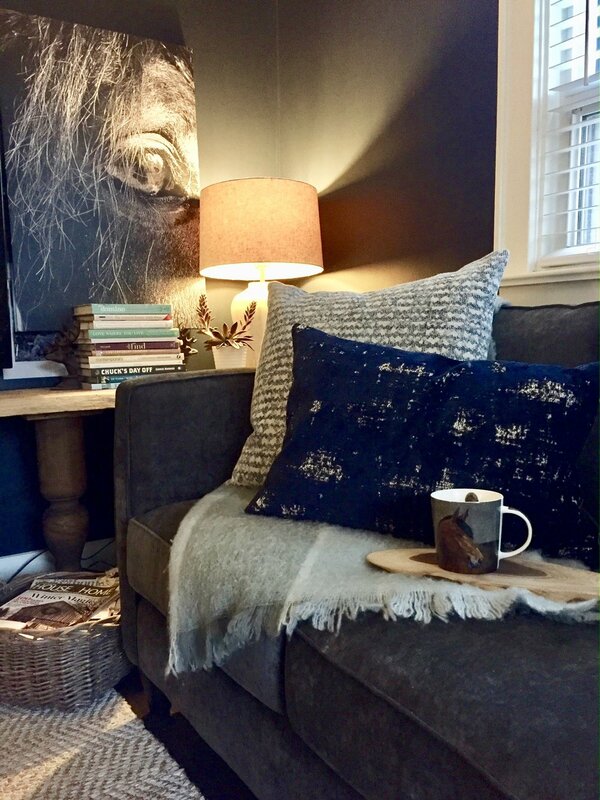 Wendy and I had fun mixing and matching the many fabtastic options she had in store and I ended up taking home 4 pillows that exude comfort, coziness and bring their own story to the space through their texture and tones. 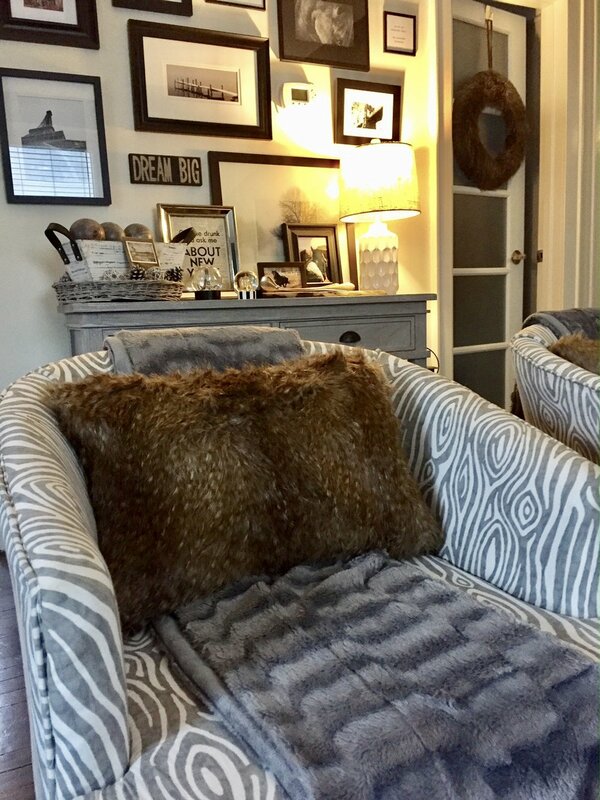 These two in the photos above have helped transform this corner of the couch/living room and the faux fur options in the photos below have added a sense of lux coziness that only 'fur' can add to a space. Stay tuned for further updates and I can't wait to show you the dining table that will be the final piece to bring this space together.... I hope you've enjoyed the journey through my design/decor adventure as much as I have!